Members of the Laredo Bucks minor league hockey team in 2007. In San Antonio, it’s estimated that the solar energy industry employs about 1,800 people. San Antonio Business Journal Reporter Sergio Chapa says that’s a solid number for a relatively new industry. Chapa found out that one of those employers has a pretty unique backstory. “His name is James Hiebert and he is the founder of South Texas Solar Systems,” Chapa says. It turns out that Hiebert hails from the Northwest Territories of Canada and he used to be a professional hockey player. “He gets a gig as a team member on a minor league hockey team named the Laredo Bucks, so that brings him to south Texas. And boy, on the day that he moved here, he moved here on Halloween many, many years ago, and he said he left Canada and it was negative 30 degrees and he got to Laredo and it was like 95 degrees, so we’re talking a 120-degree temperature swing in one day,” Chapa says. How does someone transition from ice hockey player to solar panel purveyor? Well, as the hockey league Hiebert was playing for started to lose steam, he began thinking about what else he could do. Drawing on his dad’s experience as a roofer, he decided to try his hand at installing solar panels. “It was an eye clinic in Laredo that was his first install; that system’s still there. You can Google-map it, you can drive by it and you can see the panels on the roof, ya know?” Chapa says. Chapa says it was only a matter of time before Hiebert expanded into San Antonio where his business is now the third-largest solar panel company in the city. With the special session of the Texas Legislature now underway, Democrats see an opportunity to repeal Senate Bill 4, the so-called sanctuary cities or “show me your papers” law. Democrats say that that law and the possibility of passing a “bathroom bill” are already having a negative impact on the state’s economy. The Texas Association of Business agrees, and so does Phillip Jones of the Dallas Convention and Visitors Bureau. “So far, just because we’re talking about discriminatory legislation, such as sanctuary cities, we’ve lost $66 million in bookings,” Jones says. 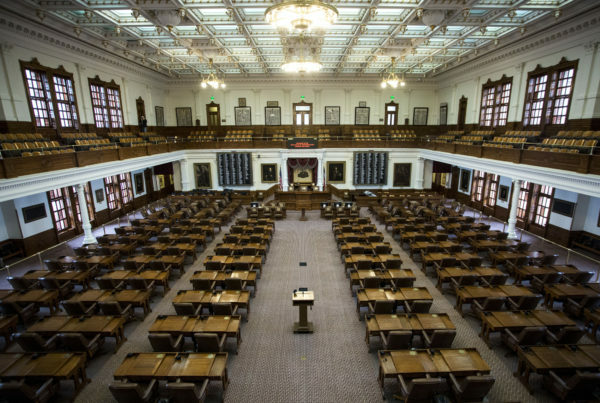 But it seems like the effort to repeal SB 4 won’t succeed, since it was passed by sizable majorities in the Texas House and Senate during the regular session. A Grapevine Police dispatcher arranged an elaborate proposal for his girlfriend that brought her to tears. Stephen Smith had a fellow officer pull over his girlfriend, Amanda Radican. The officer then told her to get out of the car because there was a warrant out for the vehicle — not exactly romantic…yet. Hearing that, Radican started to cry. But luckily, Smith hopped out of the patrol car at that point and asked Radican to marry him.